1 Dec, 2014 Rakesh Sharma Guides . Printed circuit boards or PCB's have a vital role in today’s high-tech life. All electronic gadgets from TV's to toys and from Computers to mobile phones have PCB's inside them. Usually a PCB is made up of a fiber board with copper tracks on its surface which connect the different electronic components together to form a single electronic circuit. A PCB can have from a single layer of copper connection used in common electronics like toys, PC's, mice etc, or can have up to seven connection layers in single PCB used in Computer motherboard or mobile phone PCB. Today in this small guide I would like to share with you the most common process of DIY PCB making at your home. I came to know this process in my school time, but one can Google and find many process of PCB making. Secondly I have adopted this process because it’s very easy and low in resources. 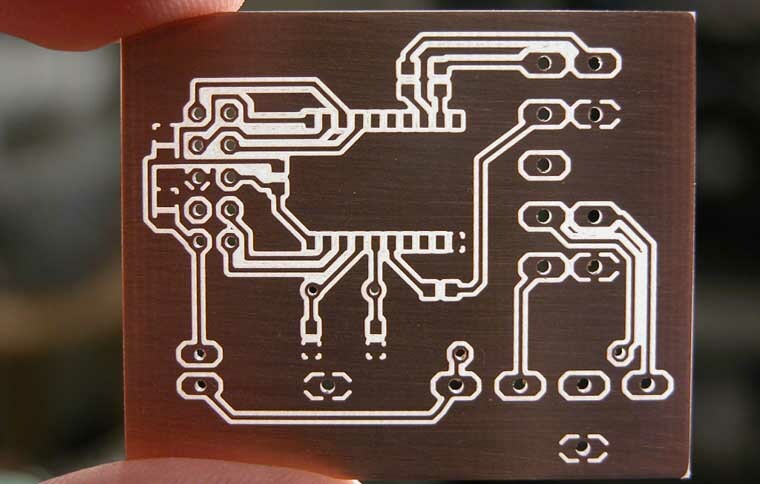 There is no proper name for this particular process but generally it’s called “Laser print PCB etching”. As the name suggests a laser printout is is used in making the PCB in this process. PC and a Laser Printer (to design and printout the circuit layout). Toner Transfer Paper (to transfer the toner layout on to the PCB). Hex blade, zero no. sandpaper and files (to cut the desire piece of PCB, polish and file the rough surface). Plastic washing tray and brushes. Drill bits to drill holes on to the PCB for component placement. Be very care full when using cutting or drilling tools. If you are not familiar with these tools better get help from a professional. Be very-very careful when working with the CHEMICALS. Try not to come in direct contact with the chemical, if so immediately wash the effected body part with lot of running water. For etching process FeCl3 solution is needed. When adding H20 to FeCl3, fumes of HCL is releases which is harmful when inhaled.